There’s no doubt in my mind that many of you listen to Adventures in Odyssey and it has become a starting point for your your love of audio drama. But, just in case you’re only an Adventures in Odyssey fan, take a look at two of the top family radio dramas on the market, thanks to Focus on the Family’s persistence for 25 years to bring back an old medium―radio drama―in a fresh way. 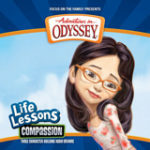 How could we not discuss our favorite series of radio dramas produced by the same creative and professional team that brings you Adventures in Odyssey? Radio Theatre brings to life many of the classics such as Ben Hur, Little Women, The Hiding Place, Les Miserables, The Chronicles of Narnia, and even some exclusive classics like The Life of Jesus and Father Gilbert Mysteries. Radio Theatre goes the extra mile with quality “audio movie that plays on the biggest screen of all … your imagination.” Stay tuned as the team releases Oliver Twist this year, and we’re sure it’s going to be well worth the listen. Learn more at the official website. Of course, newer to the airwaves is Lamplighter Theatre brought to you by Lamplighter Publishing. The team at Lamplighter seeks to build Christian character, “one story at a time.” Lamplighter Theater dramatizes rare books from decades past. One of the benefits of this drama is that some of the Adventures in Odyssey team has been involved in writing and production of stories in this series, so you know it’s going to be good. The story hones in on eccentric shopkeeper Finnian Jones, who just happens to have a library filled with these rare books. Visit Lamplighter Theatre for more information. Can’t get enough of audio drama? Edwin and the Orbs seeks to introduce modern audiences to audio theatre. Get ready to fuel your imagination in the future as Odyssey’s voice of Jimmy Barclay (Dave Griffin), Kevin McCreary, Garrett Vandenberg (both hosts of The Odyssey ScoopCast) bring you a futuristic drama. Visit their official website to learn more. Still in the production stages, Later Days follows four high school freshman and their teachers “on a journey of mystery, laughter, sadness, love, and difficult life lessons.” For now, you can follow the team on Facebook and await their official launch. As much as we’d like to, we can’t always provide minute-by-minute updates on other great dramas out there. Our focus is primarily on the Adventures in Odyssey brand (and it keeps us very busy!). Fortunately, a great podcast is available to do just that and zeros in on dramas new and old. You can visit Audio Theatre Central, hosted by podcasters JD, Roy, and Andrew. The team discusses tried-and-true radio dramas, as well as new ones to the stage. If you listen long enough, you’ll also get to hear them discuss the world’s most popular radio drama: Adventures in Odyssey! It’s a great find.